The chef cooking up one of the most exciting dining experiences in New York chats live with Fast Company readers on Wednesday, June 5th at 1:30pm (E.T.)! 36-year-old City Grit chef Sarah Simmons (and 2010 Food & Wine magazine’s Home Cook Superstar) is creating one of the most exciting dining experiences in New York. Unable to cover the rent in New York's Nolita neighborhood, 36-year-old Simmons' City Grit partnered with WRK, an interior design firm that uses the restaurant as a showroom. Seven evenings or so a month, Simmons, who is originally from North Carolina, serves Southern-inspired cuisine. 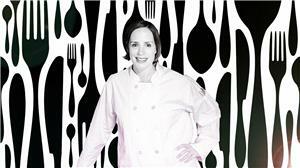 On other nights, she hosts guest chefs--generally hotshots from smaller cities looking for exposure. City Grit customers buy a ticket in advance online, usually paying $45 and up for a set tasting menu. Dinners generally sell out. The model, as Simmons freely admits, is a hack. She gets lower rent and loaner furniture; her pay-in-advance model reduces risk; and she collects fees from the guest chefs. But these tricks also make City Grit one of the most interesting places to eat in New York; meals typically end with guests bonding across the long communal tables. "It's really important to me that people make friends at the dinners," Simmons says. "Food brings people together, but not if they're sitting at two-tops," those restaurant-style tables for two. Join Simmons for a live Q&A on Wednesday, June 5th at 1:30pm (E.T. ), right here on Fast Company. Get your questions in early by using the "Make a comment" box below! Hi everyone -- Sarah will join us at 1:30pm this afternoon. In the meantime, be sure to get your questions into our queue ahead of time using the comment box above! What is your ideal meal? Where are you and who are you with?